Much like embedding your Táve contact form into your website, you can also embed a public questionnaire. 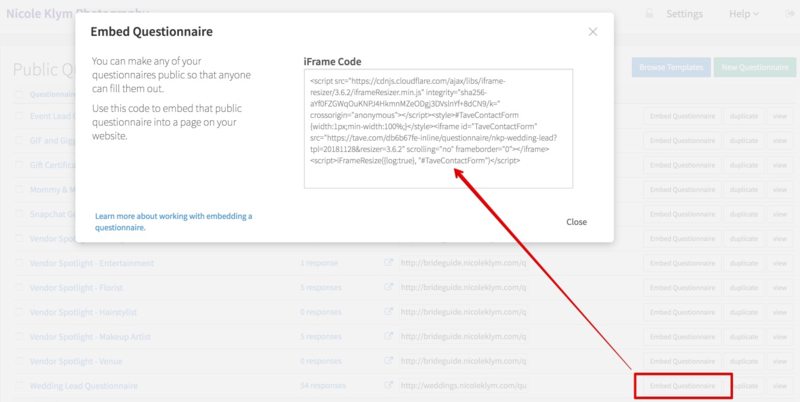 To do this, you'll use the iframe code provided in the dialog box that appears when selecting Embed Questionnaire next to the public questionnaire. First let's grab the code we'll need. Go to your list of public questionnaires in your account. You'll be presented with a list of all of the questionnaires you've made public. To the right of the form you wish to embed, you'll find the Embed Questionnaire button. IMPORTANT: You’ll need to have access to the html source code of the page you’re embedding this on. So you’ll need to look for something along the lines of “Edit HTML” or “Insert HTML”.